Like the sun rises in the morning and brings a day filled with many hopes, we deliver our services to those who needs them. This message is the origin of the name of the company, MORNING HOPE CO., LTD. Our goal is to be a Business Bridging Company in order to simply connect people, products and services in the right place and at the right time. Corporate Name MORNING HOPE CO., LTD.
CEO of Morning Hope Co., Ltd. Born in 1973. Living in Kanagawa. He loves playing football. After graduation from the University of Sunderland, B.A. Business Studies, in England, Hitoshi Furuki started his career by working, for 8.5 years, for an international amusement & consumer game company. He then joined an international licensing agency for 2.5 years. After gathering experience of the international business for more than 11 years, Mr. Furuki met a famous Japanese artist, Yoh Shomei, and, within one month, established MORNING HOPE CO., LTD. The business started as an agency licensing Yoh Shomei and other domestic and foreign artists for the Japanese market. With 5 years experience of licensing business, MORNING HOPE CO., LTD. now provides “Business Bridge” solutions which are services of translation, interpretation, business support and consulting to those who wish to penetrate the Japanese and Asian markets. Our wish is to be a “bridging company” for people, companies, and countries. 1973 Born in Kanagawa in 1973. He went to 6th Form College in England in 1990 and graduated from the University of Sunderland (specialized in marketing) in 1996. After his graduation, Mr. Furuki started his career in the international consumer product sales department of Namco Limited (now, Namco Bandai Games Inc.). He worked with staffs and clients in North America, Europe and Asia for more than 8 years and learned to understand the cultural differences in order to achieve a smooth communication. Also, he found out ways to fill the gap between people who are from different backgrounds. 2004 With wonderful experiences at Namco, Mr. Furuki moved to be an international licensing agent based in England, at Copyrights Asia Co., Ltd. He was mainly responsible for the licensing of Peter Rabbit, which is known as the world most beloved rabbit. He created a new kind of licensing product known as “Peter Rabbit concept flower shop” license and some other unique licensing products. Also, he was making the business presentations when the property owners visited their office in Japan. 2007～ Mr. Furuki set up MORNING HOPE CO., LTD. in 2007, starting from the licensing agency. At that time, MORNING HOPE CO., LTD. already had 2 clients for consulting. Also, Mr. Furuki was asked to plan and produce some seminars for foreign participants who are not native English speakers. With his business background of understanding the different cultures, he was successful in the management of the seminars as well as in the interpretation. 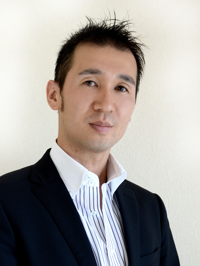 He has been continuously building up his career as an interpreter as well as a business consultant.